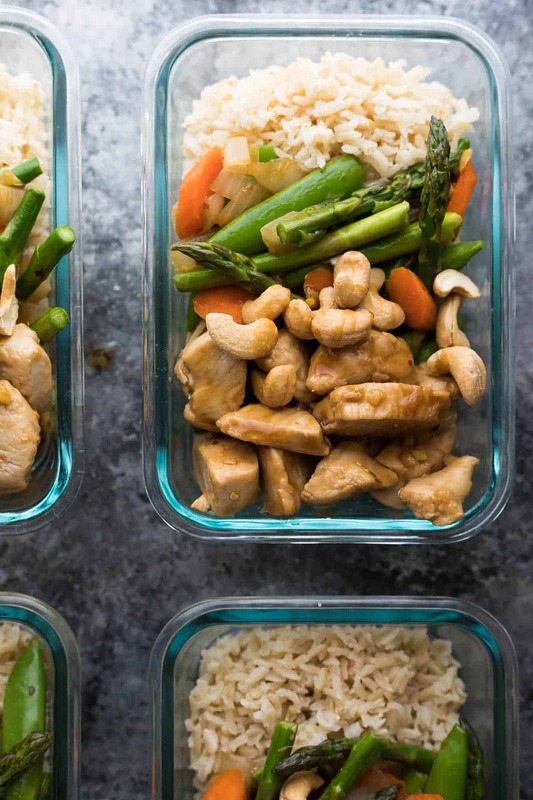 Maple ginger chicken meal prep lunch bowls are made ahead on the weekend so you have four delicious lunches waiting for you! It’s my favorite time of the year! We are finally able to go for after dinner park adventures, it’s warm enough to leave the house without a wind breaker, and the tulips are in full bloom. This was a long, brutal winter, and we have earned this weather, that’s for sure! 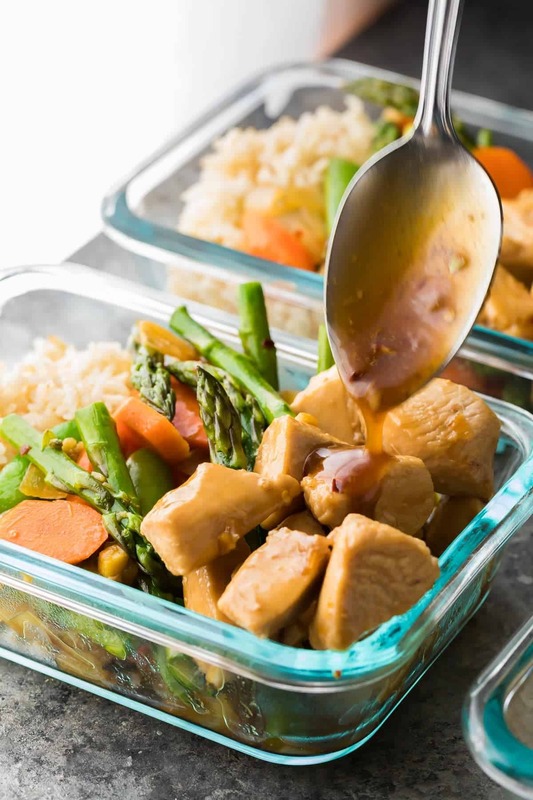 Today I’m sharing one of my favorite recipes with you guys…I’m kind of cheating because technically these maple ginger chicken meal prep lunch bowls are already on this site, but I wanted to show you the versatility of this recipe…for meal prep lunches! Plus, I wasn’t loving the old photos. I have to say, I almost didn’t post these Honey Sesame Chicken Lunch Bowls, because…well, it’s a stir fry portioned out into four lunch portions. 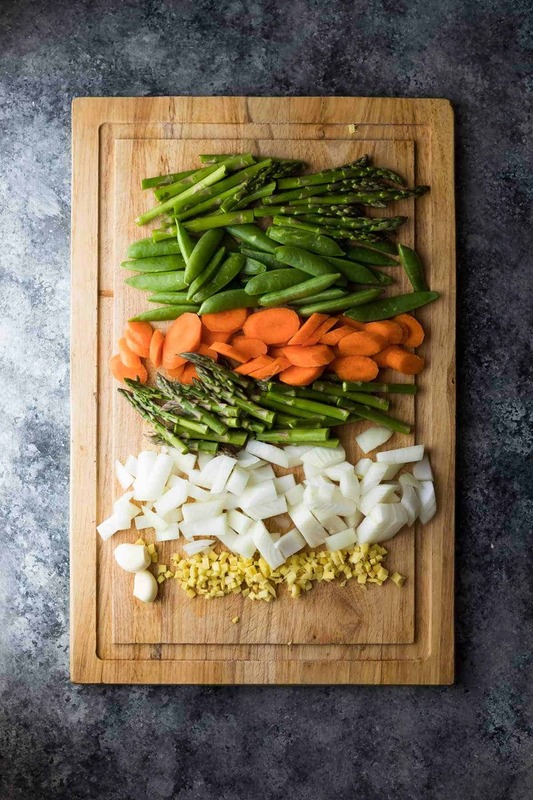 But it got me thinking, and I realized that I do have a lot of cold, salad-type meal prep lunch recipes, but I don’t have a ton of hot meal prep lunch recipes. 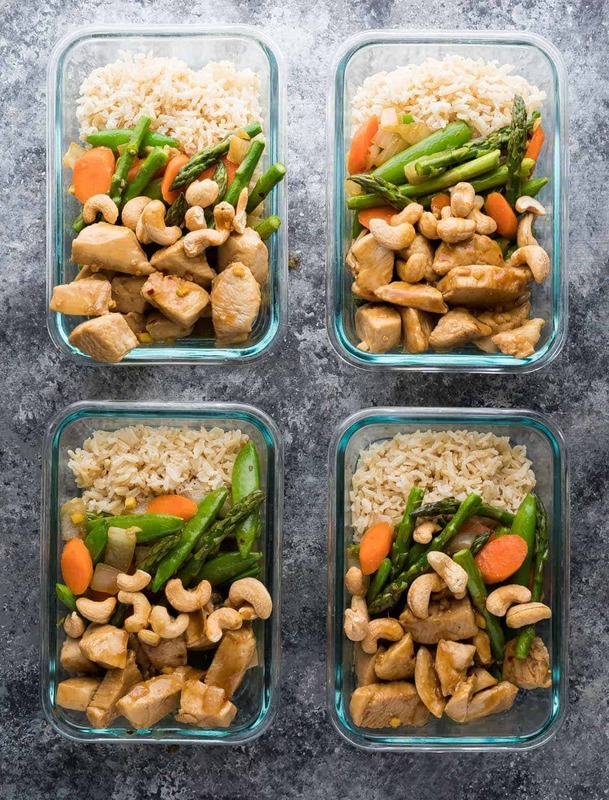 These maple ginger chicken meal prep lunch bowls were our second recipe in the Lunch Prep Challenge and got great reviews from our participants. 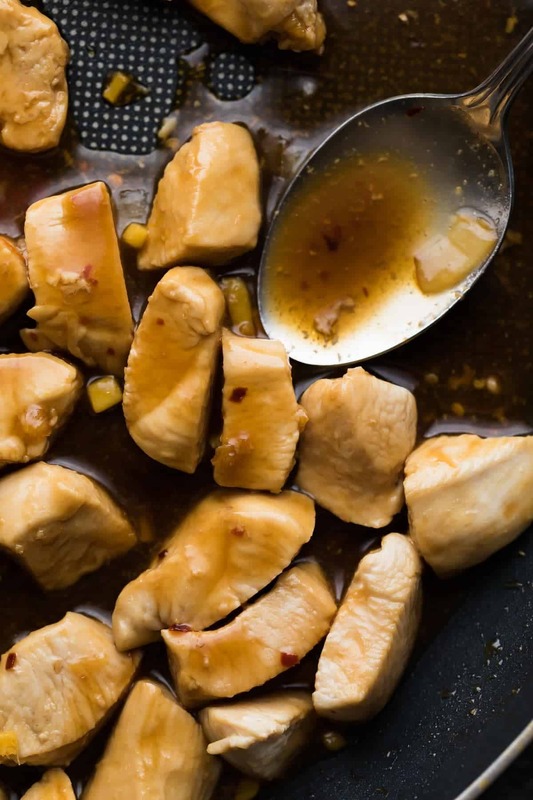 If you want a bit of variety, split the chicken & veggies, halve the sauce, and use a half batch of any of the sauces in this post of 7 Easy Stir Fry Sauces You Can Prep Ahead. So here’s to another stir fry meal prep recipe! Hope your Thursday is going well. We’ve almost made it to the weekend! for vegetarian, tofu works great! 2 large chicken breasts roughly 1 lb; boneless skinless chicken thighs are also great! Shake together all sauce ingredients and set aside. 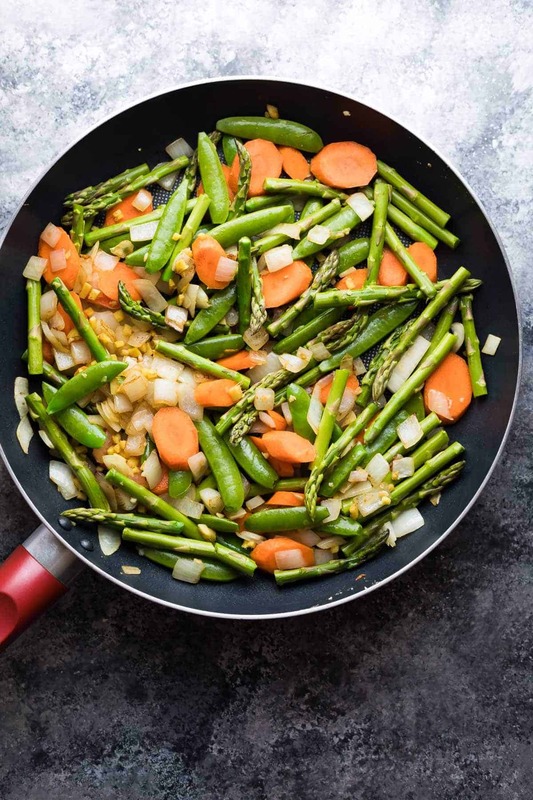 In a medium pan or wok, heat 1 tablespoon of oil over medium heat. Add the vegetables and cook for 5 minutes, or until slightly tender. Transfer the veggies to a bowl. Add another tablespoon of oil to the pan. Add the chicken to the pan, and cook for 5-7 minutes, until cooked through and no longer pink in the middle. Add the stir fry sauce to the pan (shake it up again first), and cook for 1 minute or until thickened. 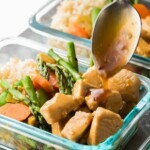 Amongst four storage containers, divide the rice, veggies and chicken. Spoon extra sauce over the chicken. OptionalScatter cashews over the lunch bowls. WOW, huge compliment! So happy you enjoyed and also great to know you can make it in the IP! I wanted to tell you I butchered this recipe. Ground spices instead of fresh, didn’t mix the premixed the sauce so was just throwing the powdered spices and pouring the liquids over the chicken while frantically trying to keep it from burning, totally different veggies. There was steam like crazy, a near fire, and I might have cried and cursed. Loudly. But it’s such a versatile, ROCK SOLID recipe that it still tastes amazing. Thank you for such a solid foundation and great addition to my meal rotation! The sauce was amazing! When do you add the corn starch? I’ve tried this many times but can never get the sauce to a thicker constancy. Hi Ann, it’s mixed in with the stir fry sauce, but you need to make sure you shake it up really well before adding it into the stir fry. If you don’t shake it up well, the cornstarch could stick to the bottom of the jar/bowl and it may not thicken. If this is not your issue and it still does not thicken, you could always try adding another teaspoon of cornstarch, but I’ve made this many times and it should thicken as written. Sorry you’re having issues with it! Which lunch containers are you using? They look like a great size! Hi Stephanie! I use Snapware 2 cup glass storage containers. They are the BEST! Recipe doesn’t show ginger and garlic..how much? this was the first recipe I tried and it’s still my fav! I love the versatility of being able to use almost and veg to my preference or what’s in the fridge! I’m so glad you enjoyed it, Christa! How much chicken do you use? Its not listed in the ingredients. Eek so sorry about that. 2 large chicken breasts or 12 oz. I have also used chicken thighs and I might actually enjoy them even more…they are still moist on day 4.